It was 12:55 so we hustled back to the visitor center. The only person there now was the rug weaver. We chatted with her as we waited. It would take about 7 months to finish the 5′ by 3′ (my guess) rug, she said in response to our question. And cost about $7000. I don’t know if that was the payment to her (the rug was being made to order) or retail. You see what I meant by “not insignificant investment” in the previous post. It was another 10 or 15 minutes before a young woman came through the door. The weaver looked relieved. 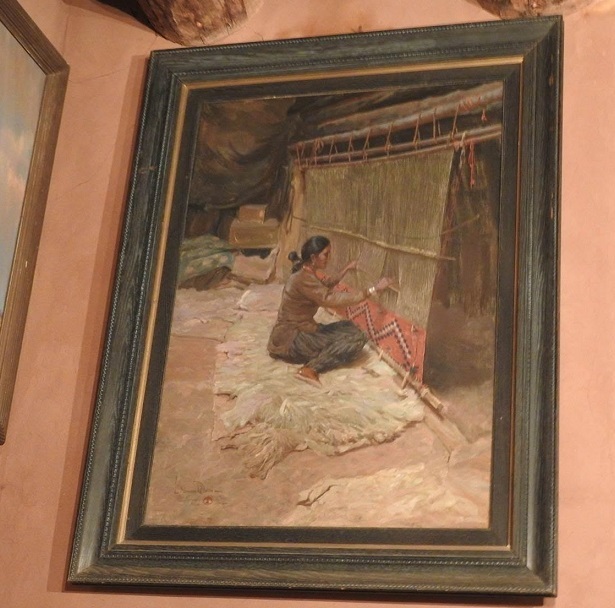 “These people want to go on the house tour,” the weaver told the newcomer. The newcomer was the tour guide. “The tour is five dollars each,” she told us. No problem. But there was a problem. While she was the tour guide, she was not the cashier. And she couldn’t take the money. “I’m in training, so I’m not allowed to handle money yet,” she said apologetically. Thankfully, just about then, a vehicle pulled up next to the building and a woman in uniform hopped out. The Elusive Ranger! She took our money and we were off. John Hubbell was a businessman in late 19th century Arizona, who built a trading empire based on his knowledge of the Navajo language and people. He also became sheriff of Apache County and a member of the first Arizona legislature. He had other homes in other states, but Granado was his primary residence. The original Hubbell house, built in 1898, was a six-room adobe structure. The Hubbells added on to it over the years and by the time it was completed in 1910, it had a sprawling 11,500 square feet. The outside still looks like a low, modest adobe house. But like a fun house, it opened up into something far larger and grander once inside. 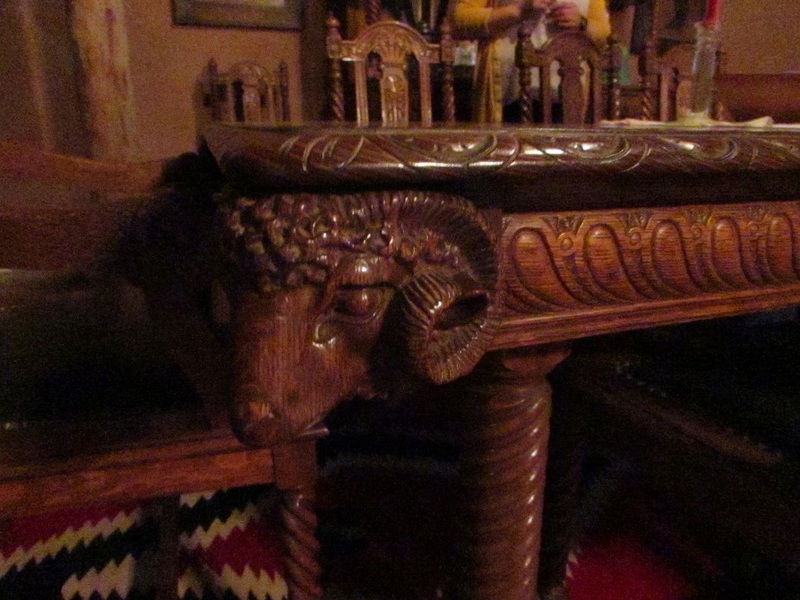 Everything now in the house, except the rugs in the great room (which are still Navajo, handmade and stunning), was there when the Hubbell family occupied it. The house is as much an art museum as it is a historic site. John commissioned the oak dining table, below, for his wife, Lina, as an anniversary gift. The sheep, it is said, represents his role, while sheriff, as mediator between cattlemen and sheepmen. Hubbell sided with the sheepmen, because he felt that sheep were more suited to the land. 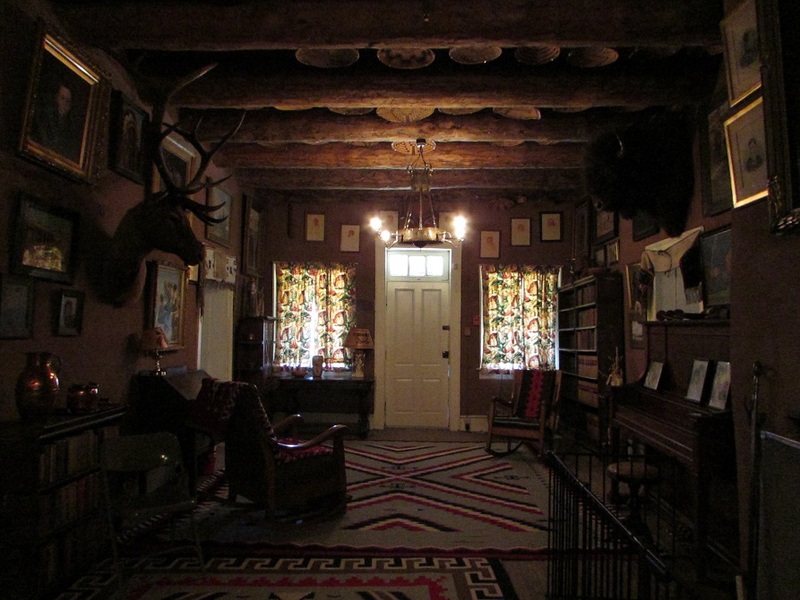 John Hubbell, Lina and their four children made the house a center of southwestern social life. Artists, politicians, scientists and socialites made their way to the Hubbell House. 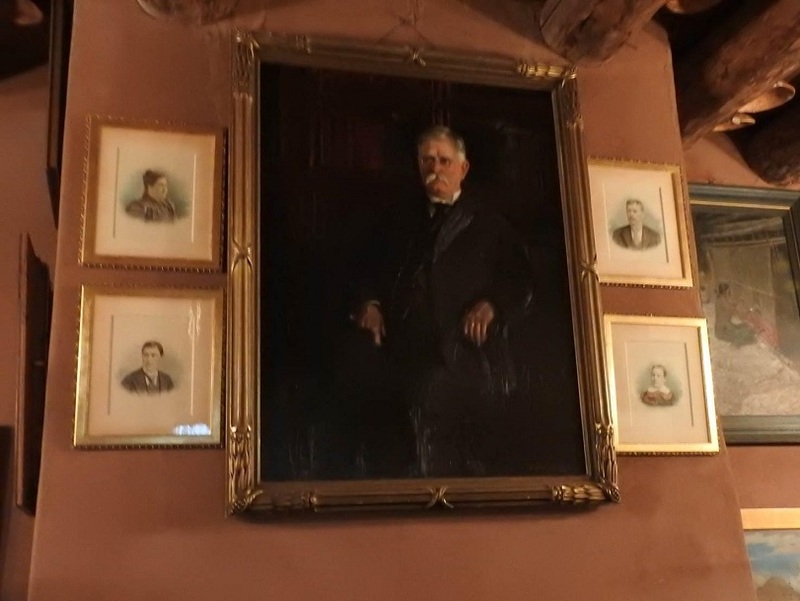 The most famous of their visitors was Theodore Roosevelt (who was a long-standing acquaintance — the Hubbells and he had friends and interests in common), who spent a few night at the house in 1913, during a tour through Navajo country. Though of a different political persuasion, John admired Teddy and was happy that people often compared him to Roosevelt. John died in 1930 and is buried on a hill next to the house, where his wife, his best friend, three of his children and a daughter-in-law are also buried . When asked why he wanted to be buried there, he was said to have joked: “My wife and my best friend are already there. I need to ensure that nothing is going on between them.” His best friend was Navajo leader Many Horses, son of Granado. While White and Navajo narratives about John’s character, life and treatment of the Navajo often differ, both sides seem to agree that he and Many Horses had a genuine friendship based on love and respect. Hubbell’s lavish lifestyle was not without consequence, even for someone as wealthy as he. By the early 20th century, he was in financial trouble and his heirs declared bankruptcy in 1954. Second Hubbell son Roman and his wife Dorothy were the ones left when it was decided to offer the property to the NPS. It became an NPS site in 1967. The tour of the house was a terrific one. The ranger-in-training was knowledgeable and engaging. 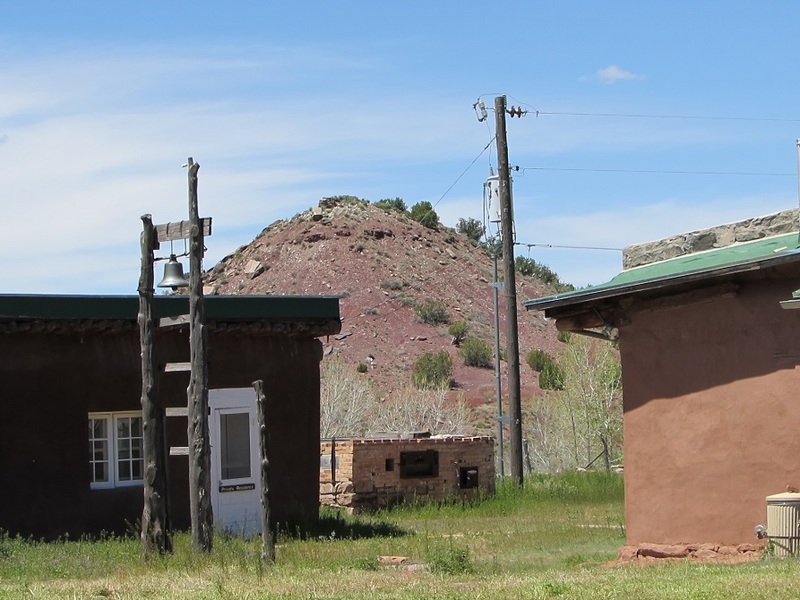 She was a local, and Navajo, and she conveyed her love of local history and culture to her audience (us and the one other couple who joined us during the tour). Granado may be off the beaten path, but it’s worth the extra miles — and the annoyance of the minor inefficiencies — to see it. Home full of hand crafted antiques and artworks – just my kind of place. Looks wonderful. Is it true that adobe houses stay a little cooler inside? It seemed so, although I’m not sure whether it was the adobe itself, or the fact that the walls were 20 inches thick.